We are located in central Oregon, near Bend. Local black ants just moved in, but the worms seem to be coexisting so far. How do I increase the moisture of the worm bin safely to evict the ants but not hurt the worms? I have a LOT of baby worms. Will the ants eat them? I tried to send pictures, but they are too big. I have not tried watering the bins yet, but I am now trying to add photos. greetings to Oregon. Ants are quite common visitors and inhabitants of worm farms. Most of the ant species are not directly harmful to compost worms but will rather look to get their share of the worm food on offer. It would have been great to see a picture of the kind of worms in your bin. Is it possible to shrink your pictures in size? Anything less than 1 Mb will be fine and can be published. As you mentioned quite right ants don't like to much moisture in their environment. So to encourage them to leave the worm bin and look for another place to live you can pore some water over the whole area of your worm bin. 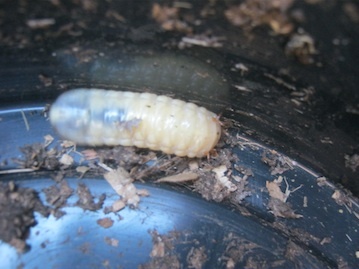 Depending on the size of your worm bin carefully pore 1/4 to 1/2 a gallon of water (without chlorine) if possible over the worm bedding and cover the worm bin again. The ants will most probably become very erratic and try to find dryer grounds. Wait for a day before you get back to the bin to have a look. They should be gone by then. If the ants have not left pore some more water over them. 1. Your worm bin must have good drainage holes in the bottom that will allow excess water to drain off to prevent the bedding from becoming soggy. 2. Keep an eye on the bedding. It should not become to compacted so that it can still hold some oxygen. 3. It is a good practice to regularly check the pH levels of the worm bedding. It should always be pH neutral or at least close to that level. Bedding has the tendency to slowly become acidic but this usually only happens over a period of time (several month or more) You can counteract this by regularly feed ground egg shells or a little of agricultural lime to your worm bin. Just sprinkle it lightly over the surface of the worm bedding and the worms will take care of it and spread it through the bedding. Having said this there is usually not to much to worry, if you have ants in your worm bin. Just make it uncomfortable for them and they should leave, Keep an eye on the conditions in the worm bin after you added excess moisture. Let it get some air regularly so some of the moisture can evaporate. As long as your worms behave normally all should be fine. Congrats on your masses of baby worms! 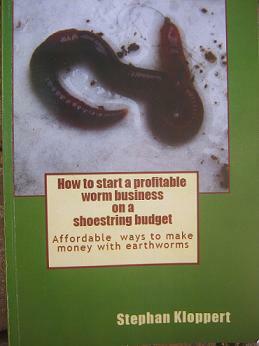 It's a clear indication that you have taken good care of your worm herd. This is a view of my worm bins. They both have ants, but I have not tried adding water yet. The bin on the right is very much alive and active. 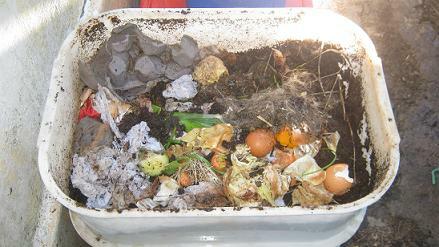 The bin on the bottom left still shows no evidence of worm activity. I find that odd because they both were equally active when we left last summer. We took a gamble leaving them exposed all winter, and I was excited to see so did survive the harsh winter. The pink bin on top is our travel bin: we took it with us in our rv. It does not have any ants. The blue bins on the top are isolated worms in clean dirt/coffee grounds for show & tell. 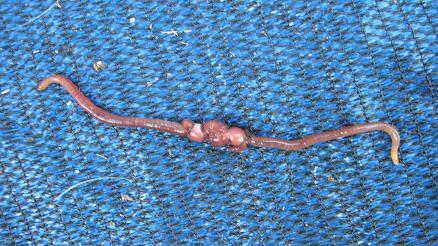 I have had red wrigglers before, and their baby worms were always tiny and white. 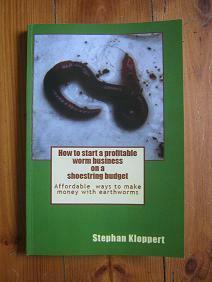 These worms were purchased locally, and the babies we had with the original batch were tiny and white. I see you have quite a few worm bins going there. :-) I like your travel bin, and think it's a great idea! Now I don't know how cold it can get in your home town but the 2 worm bins that you left behind look quite big and if they where full with bedding and food the worms might have had a fighting chance to make it through winter. This depends of course on the kind of worms you are raising in your bins! 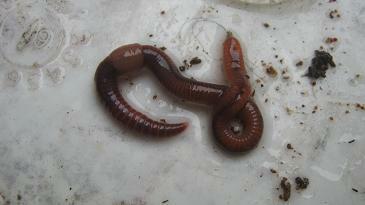 The red compost worms "Eisenia fetida" Red wrigglers are usually the most hardy worms and can handle temperatures as low as about 5 degrees Celsius / 41 Fahrenheit. Now having looked at your pictures it seems to me that bedding in both of the pictures is to dry which would firstly invite ants to set up a colony and secondly would force the worms to either leave or die and they need a moist environment to live in. 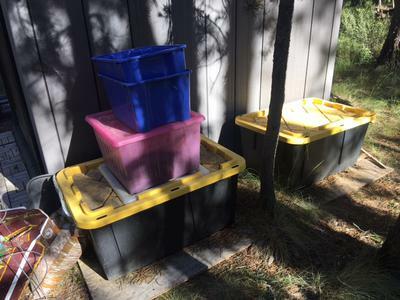 So it would definitely be a good idea to add water to the worm bins and give the worms that still are there better living conditions and increase the chances of the ants moving out in search for a dryer environment to live in. My last observation is regarding those baby worms that you showed in the last picture. 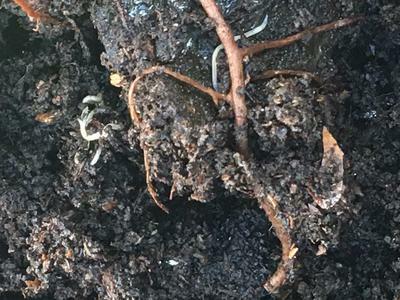 These worms are looking white on the picture and are not your typical color of compost worms. 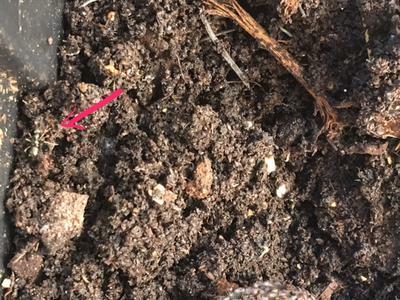 Please check carefully in your bin if you find reddish kind of worms, which would be the worms you would want inside your bin. The picture is good but unfortunately not big enough to clearly identify the worms. I don't think they will be harmful at all but are probably indigenous worms that are living in your area and somehow got into your worm bins. It is ok to just leave them be. Let me know how the situation in your worm bins develops after you added extra moisture to the bedding.